If you plan to make cookies and realize you don't have the all-purpose flour the recipe calls for, it might be worth a trip to the store to pick some up. Though you can substitute self-rising flour for all-purpose, depending on the recipe, the results are likely to differ from what you're used to. 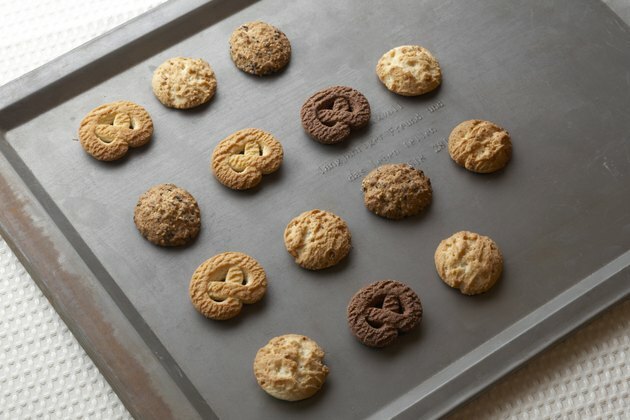 The cookies may have a different texture, be flatter or fluffier, be softer than usual and not brown well. If you can't get your hands on the correct flour, however, you may decide that the substitution is worth a try. Read the cookie recipe to see how much baking powder and salt are required. If the amount is less than 1 1/2 teaspoon of baking powder and 1/2 teaspoon of salt per cup of flour, the substitution will not work well. Substitute 1 cup of self-rising flour for each cup of all-purpose flour in the recipe, if the recipe meets the requirements of Step 1. Omit 1 1/2 teaspoon of baking powder and 1/2 teaspoon of salt for every cup of flour in the recipe. In most cases, this means you will not add baking powder or salt at all. Taste the first batch of cookies. If they lack flavor, add a bit of salt to the dough and try again. Don't leave the baking soda out of your cookies, even if substituting self-rising flour for all-purpose. Baking soda performs a function in recipes that baking powder cannot. If your recipe does not call for baking powder at all, using self-rising flour may produce an undesirable result.